At Magic Studios we know that sound effects improve audio production. Instead of people subconsciously listening to just your voice over recordings, why not bring the scene to life and keep them engaged and excited? You can do this with the use of sound effects, by picking them to fit the themes of the audio production you are delivering. A sound effect is anything placed within a sound stage that is not dialogue or music. The primary role of a sound effect is to bring life to a piece of audio recorded out of context. A sound effect improves audio production by enhancing the illusion of reality for the voice over. As well as drawing attention to key messages the audio is trying to deliver. There are two aspects in collecting a library of sound effects, synthesising and sampling. Sampling is when we record a sound ourselves (Foley). Capturing audio that occurs naturally and can be easily recorded or manipulated. Were you aware that every time you heard a hawks call in a movie or TV show it was the call of a red-tailed hawk? Or have you ever noticed that children always laugh the same in almost every single movie? This laugh is actually named the ‘Diddy Laugh’. Synthesising involves the creation of a sound from scratch using analogue or software synthesisers. Natural sounds can be generated with lots of work, but the real fun in synthesising comes with creating unnatural sounds. Most commonly used in SCIFI or fantasy soundscapes, designing futuristic whistles and laser effects. 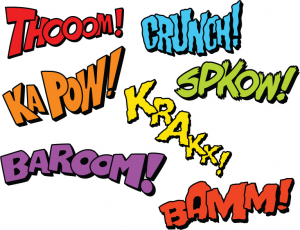 The most commonly used sound effect is named ‘BWAA’. A sound effect used in summer blockbuster trailers like Inception, Interstellar and Transformers. How do Sound Effects improve audio production? Emotion can be created through sound effects as much as a piece of music or the tone of a voice. They also help reinforce an idea you are delivering with your dialogue. Busy sound effects like the sound of traffic or a car crash can add urgency or a stressful feeling to a voice over. Whereas the addition of nature ambience to a soothing voice over can make you feel more relaxed. If you are listening to the radio or an on hold message and your mind wanders, it will still sub consciously hear the sound effects and be able to picture the theme of the audios message. This also works by drawing your attention back to what you are listening to, allowing you to be more engaged. To find out more about how sound effects improve your voice over production, chat to one of our friendly staff online or give us a call, on 1300 100 333.